Marquette University accepts donations in many forms. Listed below are the most common ways you may make a gift. If you have any questions about making a gift to Marquette, please feel free to contact Emily Hernandez, Advancement Services, at emily.hernandez@marquette.edu or (414) 288-7346. Use Marquette's secure Online Pledge Form — the easiest and quickest way to make your gift. Memorial and honorary gifts are a special way to remember a loved one, friend or colleague. Gifts can be made online at marquette.edu/giveonline or by phone, mail or fax following the instructions outlined above. For gifts submitted through mail or fax, please include the name of the person you are honoring. Memorial gift envelopes are also available. Please call (414) 288-0359 or (800) 344-7544 and Marquette will furnish a supply to the funeral home in advance of the memorial service. 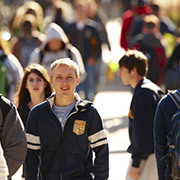 Recurring giving is an easy and convenient way to support Marquette students throughout the year. You choose the amount you wish to give each month through your debit card or credit card, and you can change or cancel your pledge at any time. To sign up for recurring giving, visit our secure online pledge form and select the recurring gift option in the Gift Details section, or call us at (414) 288-7346. Please contact Emily Hernandez at (414) 288-7346 or uagiftservices@marquette.edu if you are interested in making a gift by wire transfer. With more donors making gifts online, Matching Gift Company Search 2.0 allows donors to search a database of matching gift eligible employers. Questions regarding matching gifts can be directed to Emily Hernandez in Advancement Services at (414) 288-7346 or emily.hernandez@marquette.edu. Do a MATCHING GIFT Search Now! A gift of long-term appreciated securities, either publicly traded or from a closely-held company, may provide you with greater tax advantages than a gift of cash. You may deduct the current fair market value as a charitable gift and completely avoid any capital gains tax on the appreciation. You may download Marquette's Electronic Transfer of Stock Information Sheet below for instructions your broker will need to complete the transfer. Questions regarding gifts of stock can be directed to Tinesha Gladney in Treasury Services at (414) 288-0804.